His name is David Ferriero, and he goes by the acronym AOTUS. That’s Archivist of the United States to anyone not in the know. He’s America’s Collector in Chief, the head of the U.S. National Archives (NARA), and he’s looking for some help. And, Ferriero thought, how better to promote access to public information than to help transcribe some of the most interesting — and, by the way, genealogically useful — documents of our nation’s history? So this week NARA’s AOTUS has a Transcription Challenge going on. Citizen-archivists are challenged — okay, invited — to join in the challenge to transcribe any one (or more!) of millions of pages of handwritten or typed documents held by NARA and available through its online catalog.2 By tagging and transcribing the documents, our work will make the information accessible through the catalog system. So the end result will be both text and, in effect, an every-name index to the transcribed documents. And oh… the documents… they really are fun. • Papers of the Continental Congress, including handwritten depositions from men who were there at the Battles of Lexington and Concord. • Record Books of the Confederate Government, a wide variety of handwritten books from the Executive, Legislative, and Judicial Offices of the Confederate Government that are just chock-filled with information about soldiers and civilians caught up in the Civil War in the southern states. • Harriet Tubman Davis’s application for a widow’s pension based on the Civil War service of her husband Nelson — 100 pages or more of personal and family history of people born in slavery who served in freedom. • Records Relating to the Prosecution of Al Capone… or Bonnie and Clyde… or James “Whitey” Bulger… or a host of other federal criminal cases. • “Spirited Republic” records, from NARA’s exhibit highlight the government’s role in alcohol. Lots of alcohol labels and records for you to transcribe, including a Shamrock Brew Label. • Declassified records, a wide variety of records that used to be considered secrets of the United States. And CIA records too. 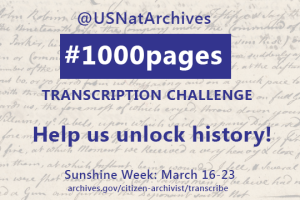 The goal is to have 1000 or more pages of historical documents transcribed during the week. The Legal Genealogist thinks this community can knock that goal out of the ballpark. Even the documents called advanced in this challenge are well within the average genealogist’s capabilities — we deal with bad handwriting all the time! All you need to do is register for an account with the National Archives (it’s just a username and password deal), choose your target document and get started. The documents can all be downloaded or read online, and entering the tags (names, places and the like) and the transcription is really easy. So come on out and join AOTUS — and me — and genealogists and historians across the country and transcribe a page or two. You can read more about this challenge in Ferriero’s own words at his blog, AOTUS. Thanks for the heads up about this…I’ll do my bit! Great! It really is fun. Thank you Judy….all ready on it after getting an email notice this morning, through my being registered with the Library of Congress website. Just awaiting my confirmation email from NARA. Does this have to stop at the end of the week? Good heavens, no! I’m confident this will go on as long as there is (a) a NARA and (b) a single person willing to help! Judy, I think you crashed the NARA server. No confirmation email came through, so I clicked “didn’t receive the email? click here” and it spun around for about a minute and said “there is a problem.” Oh my. I also signed up for AOTUS blog and that was no problem. My, my, my. Just when I was getting excited. Patience, grasshopper! I’m sure it’ll work eventually. Can’t wait… I’ll give it a go after work today! Thanks for sharing.